More taunting sun outside my window, giving one the hope that spring is just around the corner. The bright rays are deceiving, however, as I note yet another light blanket of fresh snow. 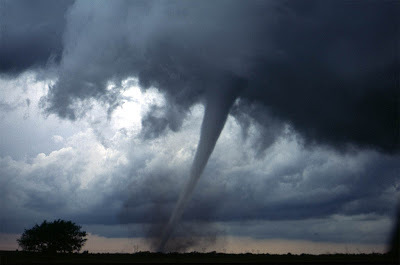 All the same, although concern of winter weather hazards still plague many, the warmer temperatures will soon be here, and with it, the potential for unexpected danger across much of the country - Tornado season. Unlike some other natural disasters, the lurking threat of a tornado springing up is one that keeps this Mom ill at ease. The tornado season in the US is typically begins in March and lasts well into August, although winter twisters have been documented. 2011 was an exceptional year for tornadoes and I can recall the panic I felt welling up during several Lacrosse games, upon seeing the skies change dramatically and hearing the warning siren sound out its alert. Although I knew my daughter, her team and the spectators could quickly take shelter in the sturdy stadium outbuildings, I scrambled to call my son at home a few blocks away, while his father slept in preparation for a midnight shift. As this next season is almost upon us, I'm struck that, despite my angst last year, I have really done nothing to ensure my family is prepared. Certainly, as events occur, we have impromptu discussion, in which I discuss matters of safety and hurried run through a quick checklist. We always have flashlights about the house and bottled water just in case, but certainly not anything as coordinated as an emergency kit. The bottom line: we are not prepared. Educated and certainly with the resources and time, should be decide to make use of them, if my family is not prepared, what of families and children in need? When a parent is struggling with the heart-wrenching mission to feed and shelter their child, contending with an existing personal crisis, preparing for unexpected emergencies is likely not a top priority. With winter weather hazards still a concern across much of the nation, and welcomed spring thaws bringing with them the possibility of flooding and tornadoes, having an emergency kit at the ready at all times is essential. As my family makes a commitment t better educate ourselves, be prepared and create a family emergency kit, we will also be participating in the February Champions For Kids SIMPLE service project ~ the Energizer Light Up A Life campaign. Creating some Care Kits for children in need will be so SIMPLE to do while my family prepares for our own safety. Although my family's previous participation in the Champions for Kids Abbott Pack A Snack program certainly filled a need and provided benefit to many children, we overcome by the sheer number of children in need in our community. In attempt to spread the caring and giving to even more children, my family has reached out to members of one of our children's extra curricular groups, my son's Destination Imagination team and organization, to join us in both spreading the word about how SIMPLE it is to make a meaningful difference, as well as to make contributions for our Energizer Light Up A Life Care Kits. As SIMPLE as a quick email and spreading the word in our regular meetings, we hope to expand our contribution, helping even more children! We are excited about the potential to give even more, by banding together with other families to create Energizer Emergency Care Kits that will help a child and their family in the event of winter disasters, like power outages and snow ins, as well as for other seasonal concerns, such as floods and tornadoes and even unexpected disasters, like fire. How does your family stay in the know and prepared for unexpected disasters? Has your family been affected by a natural disaster? What would you put in a Care Kit to keep children and families safe during winter weather hazards, or other unexpected dangerous situations? Have you ever inspired others to join you in a giving effort? Tell me in a comment below! I'd love to hear all about it! AND BECOME ONE OF MILLIONS! Gather your friends, family, and co-workers to help children stay safe and be prepared by putting together Care Kits for kids! Include items like band-aids, hand wipes, tissues, flashlights, extra batteries, and bottled water! Give the Care Kits to an organization in your community that serves children (like a school, shelter, religious organization, or nonprofit). Click here to send us your great Report and Photos! I did not know that tornadoes were more common in the US! I cannot wait to see what you put in your kit! When I lived in the Northern States Tornadoes were something we watched for now that I live in Florida it is hurricanes we prepare for during their season. This was an interesting post. Thanks for sharing. Living in Minnesota we face tornadoes too! Thankfully, I've never actually seen one or had one very close to my area. I love that you are spreading the word and hopefully some of the other members will want to get involved too! Living in Tennessee I know all too well the destruction of tornadoes ~ what a great project to get involved with. I'm reading this just as I heard about tornado warnings here for tonight. I need to remember to check my flashlights and make sure I'm prepared! We've had a lot of tornadoes in our area lately. We always keep supplies available. This is great Terri and I love that you are getting your son's group involved. This not only serves to expand your kit, but helps to spread the word further within your own community about Champions for Kids. Can't wait to see what you do with your kit!